This well loved and cherished second home offers superb levels of comfort and quality on in one of the most desirable areas of Carvoeiro. 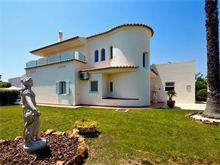 Just a short walk from Carvalho beach, the villa is well located to enjoy a peaceful Algarve villa holiday. The property is tastefully furnished throughout to a high standard with the bedrooms arranged over the ground floor and TV room, that can be used as a fourth bedroom, and the living area on the second floor with spacious balconies and terracing for al fresco dining with sea views. There is direct access to the pool and grounds from the upstairs gated staircase. 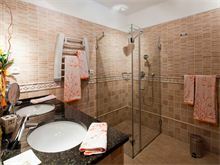 All the bedrooms benefit from their own bath or shower room with separate walk in showers and air conditioning. Approximately 4kms from the town centre (bus service available), 1km from the nearest shop 100m from the nearest restaurant and 300m from the beach. Entrance hall. Twin bedroom with shower room en suite. Double bedroom with en suite bathroom and separate walk in shower. TV room with sofa bed which leads through to another twin bedroom with shower room en suite. Separate shower room. Upstairs to large open plan living and dining room with satellite TV, DVD and patio doors to a large part-covered terrace. Kitchen with dishwasher and microwave. Guest cloakroom. Pool heating, air conditioning (bedrooms only) and Wi-Fi are available at extra cost, if required. Car hire recommended. Maid service 5 times per week, laundry by arrangement. Great villa. Everything we could want and then some. 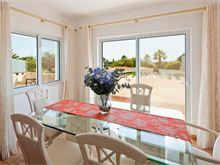 We will definitely consider this villa again or another of the Affinity Villas. This is the second time we have stayed as Casa Juniper. Location excellent. a real indulgence for just two of us. Would suit a family or couples very well as there is enough space for privacy. The bus service is excellent and shop, restaurants within easy walking. We will probably not hire a car next time we come...as we will be returning. Quiet, comfortable and relaxing...what more could a couple of oldies require !! Excellent Villa, hire car a requirement, location excellent, onsite restaurant excellent but slightly expensive. Villa location excellent for sun time, nice and peaceful. good bus service just outside villa. swimming pool brilliant. car hire a must. The Villa itself, couldn't wish for more. We absolutely loved Casa Juniper. 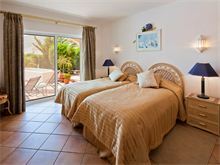 Everything you need on holiday - comfy beds, spotlessly clean, brilliant pool, well equipped, great location for beaches. Would highly recommend Casa Juniper and Affinity Villas ! Where do I begin, this villa is fantastic, so well equipped and clean and bright. Pool area was so private with the sun on the pool all day. We stayed as 6 adults, love the barbecue which we used a lot, pool area fantastic and upstairs on the roofs were lovely in the evenings. 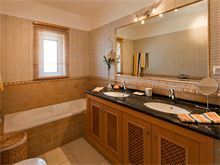 The villa was beautifully clean on are arrival and maintained throughout by the cheerful maid. This villa is spacious, luxurious and has great outdoor space, with a large pool. We have holidayed in 7 villas in and around Carvoeiro it's our favourite place in the Algarve. This is by far one of the best villas we have stayed in it was like home from home. We found the maid very helpful she could not do enough to make our stay as comfortable as possible. We had the pool heated and it was great, swam every day even though it was October. The facilities at the villa were brilliant and kept spotlessly clean, if we went back to Portugal we would stay at villa Juniper again. 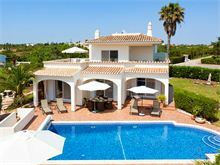 This was our second visit to Casa Juniper, which is a beautifully furnished and appointed villa, in a great location on the outskirts of Carvoeiro. 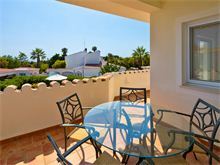 The villa is equipped to a high standard and has a great swimming pool. There are plenty of outdoor seating areas and a lovely upstairs terrace ideal to enjoy our evening meal and watch the sunset. We would not hesitate to return to Casa Juniper for a third visit. Beautiful villa and peaceful location - everything you could possibly need has been thought of . Pool is in the sun all day and having the bedrooms on the ground floor keeps them cool. Will definitely return - Affinity Villas service very efficient - love the travel pack that arrives a couple of weeks prior to travel date. A superb villa in a wonderful location. Quiet, but only a short journey to Carvoeiro if needed. Just the ticket to recharge your batteries!! Casa Juniper was an excellent selection for us as a family of six adults. 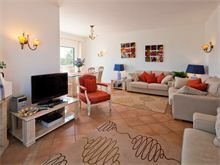 The villa was furnished and equipped to a high standard and in a quiet location. The pool area had plenty of seating and the pool a decent size. The bedrooms and bathrooms were all superb, the maid service excellent. Everything has been thought of to enable a stay at this villa to be enjoyed to the maximum and worthy of a 10/10. 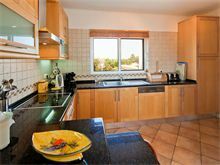 This is a lovely villa, superbly equipped and in a nice complex. 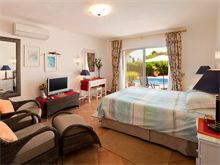 The rooms and bathrooms are spacious and the pool area is great. The villa gets the sun for most of the day. Excellent quality in a brilliant location...you could get away without hiring a car as amenities and bus service were close. Just two of us, however, the villa would be great for family with teenagers as there is a separate sitting room which could be used by them...or another couple. We are considering two weeks next year!! Casa Juniper was all that we could have wished for, after 22 consecutive years of visiting Carvoeiro, we certainly have high expectations of accommodation and facilities, of which Jupiter excelled. House management and maid services were attentive yet unobtrusive. 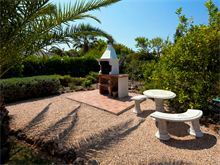 As we know the area like the back of our hands, it was very important to be conveniently situated and we were highly delighted at such a lovely villa. Looking forward to visiting again next year.